Remarkably small number for a Bealtaine Day, though there were several other walkers in the woods, much more than usual, obviously searching for the Bluebells. 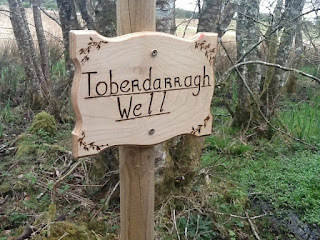 Some took an interest and fascination for Bards In The Woods and what we were doing. Not bad weather, warm, 16C, which I think makes that the warmest Sunday this year, dry but quite cloudy. A couple of sprinkles of sun. Bluebells were still struggling, out in abundance, but still most of the petals refusing to display themselves. There was some blue groundscape though but nothing like last year yet. There is hope and optimism though, because like other wild flowers this year, like primroses, cowslips, violets and dandelions, there looks like a second wind of new flower buds shooting through. During this week I think the blue groundscape will be rich ... so I am making two more visits here during the coming week. Who will join me for them. The main purpose of today was to mount the new Toberderragh Well sign created by Clare Lynch, and mounted by her at the well too, with a little help from Jonathan Pipe, and then for rest and picnic. I did a little stone scrubbing but this was more of a time to relax and picnic really. 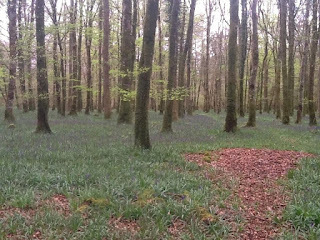 Susie had some lovely poems to share within the Bluebells, Clare shares some of John O'Donohue's writings and I recited Duir The Oak by an Oak. I think we left around 6 pm after a good fun time together through a warm afternoon, at last. . I will be back in these Bluebell Woods on Wednesday and Saturday afternoons. Who would like to join me? 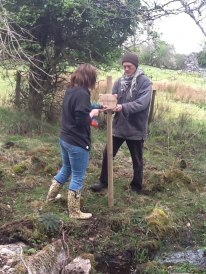 Next Sunday, 13th May, is a very special Walk and Picnic in the Union Woods, Co. Sligo, in the southern National Parks and Wildlife area with the abundance of ancient oaks. 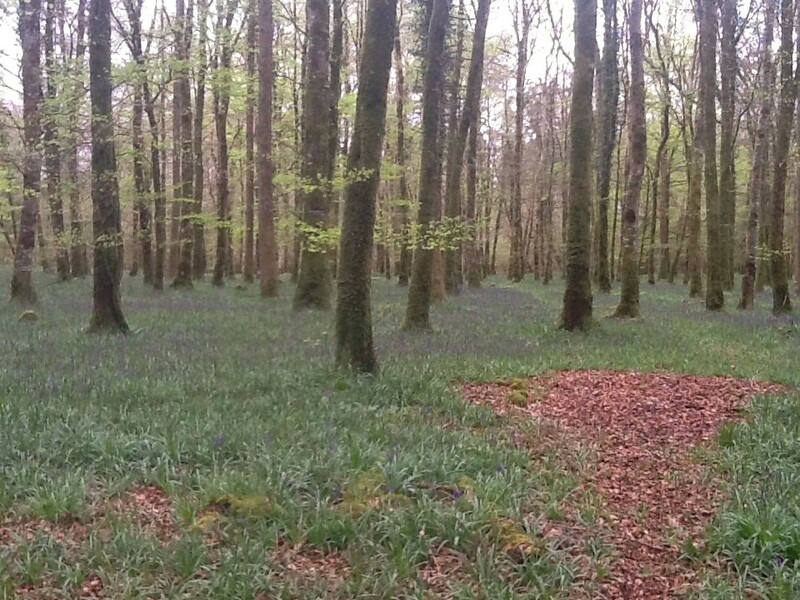 Sunday will be our last Woodland Walk and Picnic before the Irish Cabinet decision on selling off forestry harvesting rights which, if passed, will restrict our access. This rare abundance in ancient Oak treas is worth a visit as it not now seen in many parts of Ireland. This a very special and beautiful place to be, This is not Coillte land but National Parks and Wildlife Service land though we may picnic on the joining Coillte land. Please demonstrate your passion for the forests and the vital good they do for us and share with us.